This Beautiful Angel has captured my heart and I want to share her story with everyone. 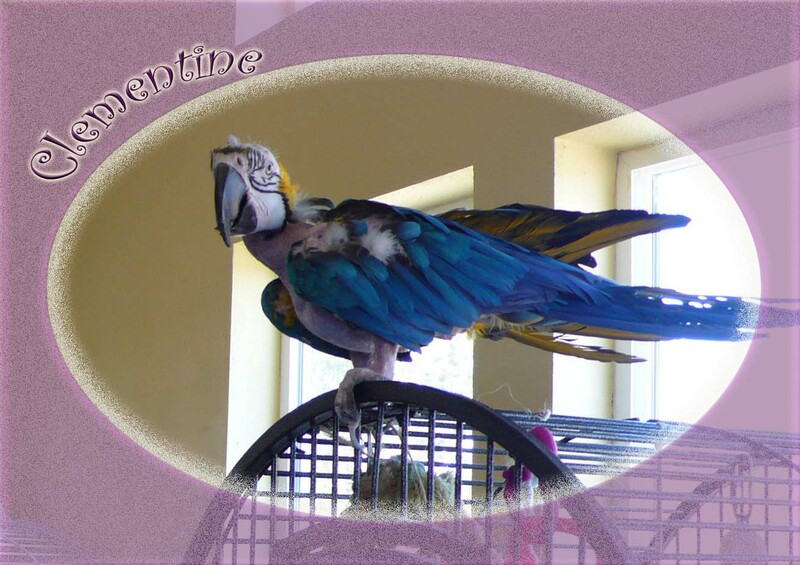 Clementine is 20+ years young and resides at Best Friends Parrot Garden and is available for adoption. 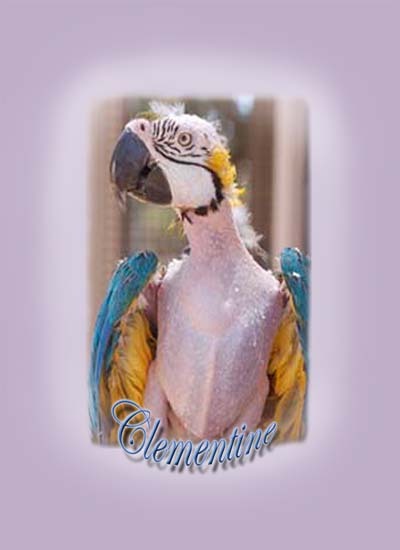 You can read all about her here Clementine at Best Friends Parrot Garden I have not met her personally, but something about her just speaks to my heart. She knows what it’s like to be picked on. Literally! 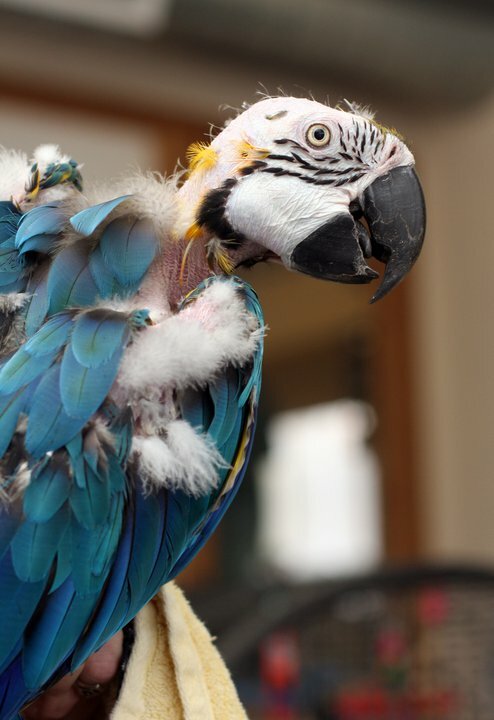 Clementine spent 20 years in a tiny cage with another macaw friend Big Bird that she now has permanent bald spots. He was plucking out all her feathers! She is NOT a feather picker. They had No toys, nothing to do. Well her friend found a way to pass the time…over-preening Clementine. After 20 years, the feather follicles are so damaged that she will never regrown feathers. But we know she is beautiful. Once Big Bird and Clementine got to the sanctuary, they got their own cages…and to our surprise, they were much, much happier apart.By providing them with a large outdoor flight aviary, teaching them foraging, and providing more enrichment to their day, Clementine and Big Bird finally have the space to express themselves without picking on one another. Big Bird has found his forever home, but Clemmie is still waiting. Shy and gentle, Clementine enjoys playing with toys, phone books, and blocks of wood. She’s a Blue and Gold Macaw, which is a very curious kind of parrot – always wants to explore what’s going on. So any new games and foraging expeditions are a delight for her. She enjoys sitting in the breeze (though please make sure she doesn’t get a sunburn out there! ), and although she’s a timid girl, she would very much enjoy slowly to getting to know you. Clementine is waiting in excitement for your call. Clementine has now been adopted! She is now starting her journey with Julie Brock. 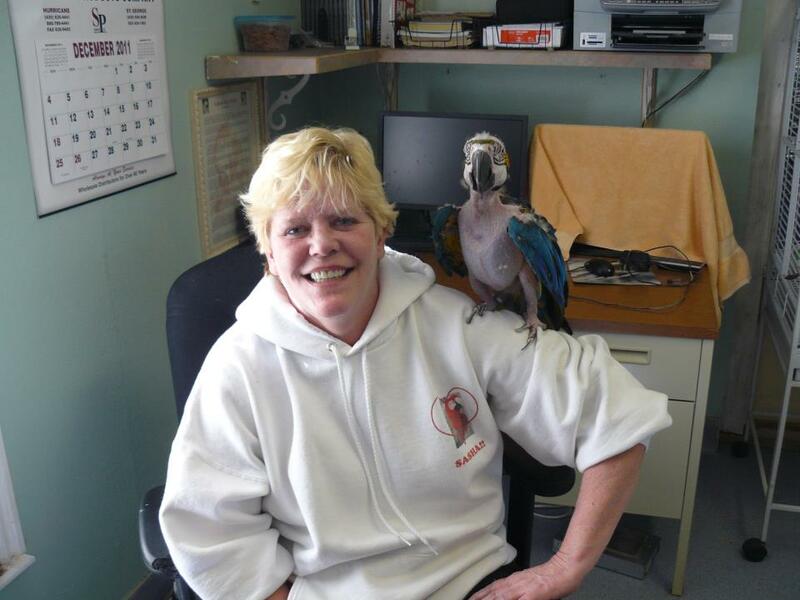 Clementine had been at Best Friends Parrot Gardens for over 7 years. Waiting for that special person who would love her for the beautiful soul she truly is. Julie first met Clementine a couple of years ago and wanted to adopt her then. Julie had loved Clemmie instantly and never forgot about her. In January of this year, Julie had decided to adopt another Angel from Best Friends and while she was there she inquired about Clementine. The staff also thought it would be a good match but they needed to ask Miss Clemmie :). Best Friends always lets the Angels decide who they want to go home with. Clemmie didn’t have to think it over for very long, she was very happy to have Julie has her new companion and caregiver. So together they are now writing a new chapter in their journey of life! She is precious…. I am sure you are already overwhelmed with people wanting to adopt her. Thank God for people who love her…..
Actually Clementine is in need of a good forever home. She has been at Parrot Gardens for a very long time now. She needs someone who will see her beauty. I am told she is very sweet and gentle. I feel probably some folks cannot get past her being a nakkie bird :(. If I were close by, I would be adopting her in a heartbeat!!! When I first saw her pic, I fell in Love and have thought of her everyday since then. Oh dear Clementine! You are lovely. I wish I could give you a home but I have 2 other big ones already. Otherwise I would take you in a heartbeat. Just love you!! Clemmie, we just love you so much! I would bring you home with me in a heartbeat if it were possible. Ms. Clementine has been adopted (by me – Yay) and is happy, happy, happy as am I! Whoo-hoo! She is one very lucky girl to have found a Mommie who loves her so very much!